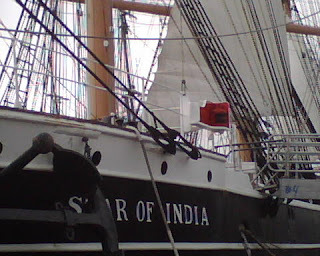 I spent about an hour the other day wandering above and below decks on the Star of India - the world's oldest active ship docked in downtown San Diego at the San Diego Maritime Museum. It was a near religious experience...the weight of her history whispered to me from every corner and I came away deeply gratified that the Museum and its generous benefactors had seen fit to restore and maintain such a seafaring legend. A bit of her background below...you can find much more here. She began her life on the stocks at Ramsey Shipyard in the Isle of Man in 1863. Iron ships were experiments of sorts then, with most vessels still being built of wood. Within five months of laying her keel, the ship was launched into her element. 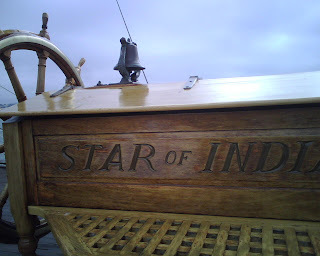 She bore the name Euterpe - after the Greek goddess of music - and was renamed the Star of India by her owners int he early 1900's. Last time I was in San Diego, it was close to Halloween, and the Star of India was dressed up as a ghost ship, with tattered sails, cobwebs, and a literal skeleton crew. 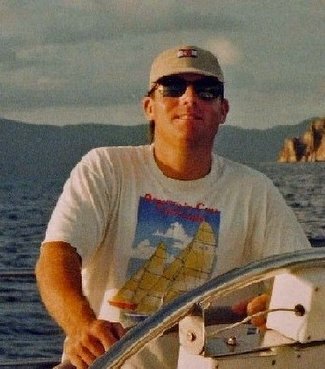 I know a few of the docents there, one helps contribute to our site gCaptain.com, it's a great place and well worth the visit. I too was fascinated by the Star. I was priviledged to be able to get into all the "not for the public areas" as well. There was the climb to the main t'gallant yard for a pic or two, and a chance to get into the bosun's shop forward and climb about the cavernous chain locker. The neatest part was ride on the railway in the bilge, a pair of carts on rails used to move ballast fore and aft for trimming, in tiny laying-flat-on-your-back tunnels. Being down there, right tight with the cold iron, in utter darkness, I really felt like I was one with the bones of the old girl.